Dr. Leonid Yurganov kindly shared an overview of his analysis of IASI methane levels over the years. 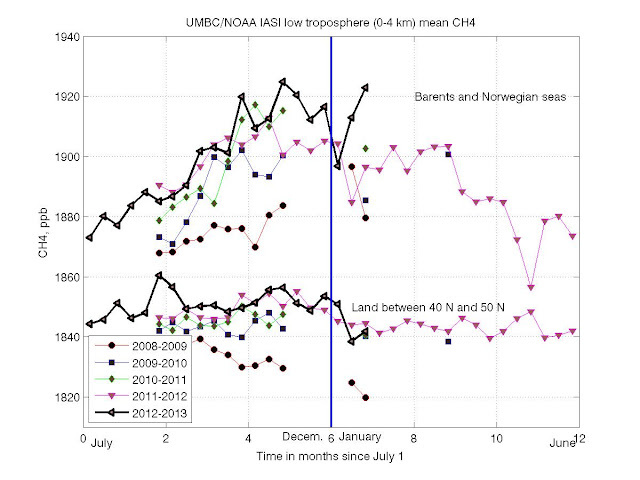 The overview shows a marked difference between methane levels in the Arctic and methane levels at lower altitudes, i.e. between 40 and 50 degrees North. Furthermore, the overview shows a steady increase in methane levels over the years, both at high latitudes and at lower latitudes. 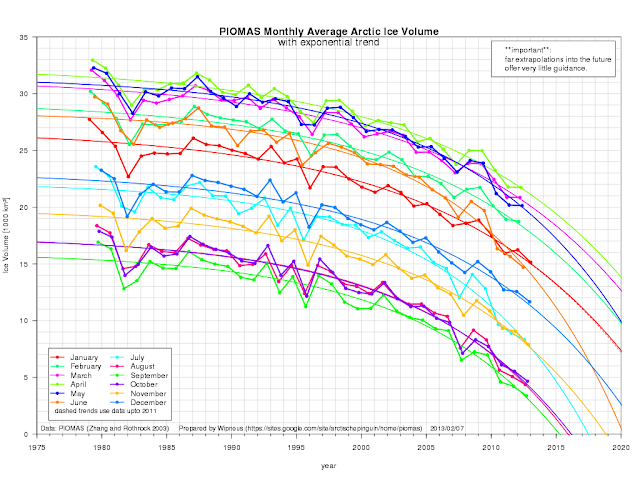 Over the Arctic, mean levels of well over 1900 ppb are now common. The overview gives the mean values for methane levels. Peaks can be much higher. 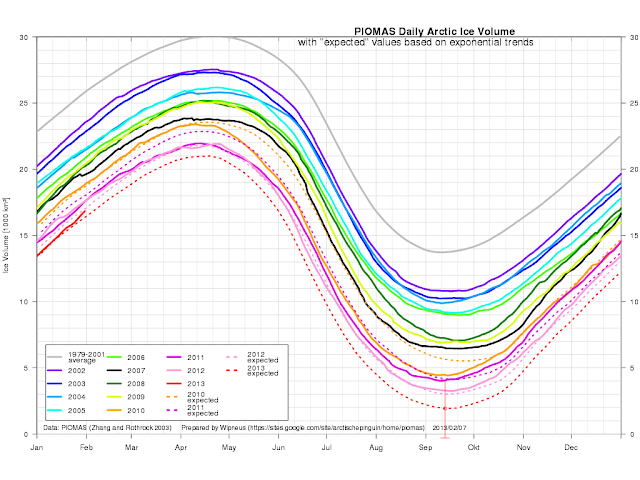 Levels of up to 2241 ppb were registered above the Arctic at 742 mb on January 23, 2013 (see earlier post). Moreover, high levels are registered over a wide area, particularly over the Barents Sea and the Norwegian Sea, which are currently free of sea ice (see earlier post), indicating worrying releases of methane from the seabed in that area. How much extra methane is released to account for this rise in methane levels? Dr. Yurganov explains: “this may be a relatively slow process, 7 ppb per month for the area between Norway and Svalbard means only 0.3 Tg per month. But in a longer time scale (at least several years) and inclusion of the autumn Kara/Laptev emissions it might be very important both for the methane cycle and for the climate. Further discussion promises to be fruitful”. Dr. Yurganov plans to update his overview on completion of further analysis of existing data of IASI methane levels for earlier periods, and complemented with further periods in future as the data come along. 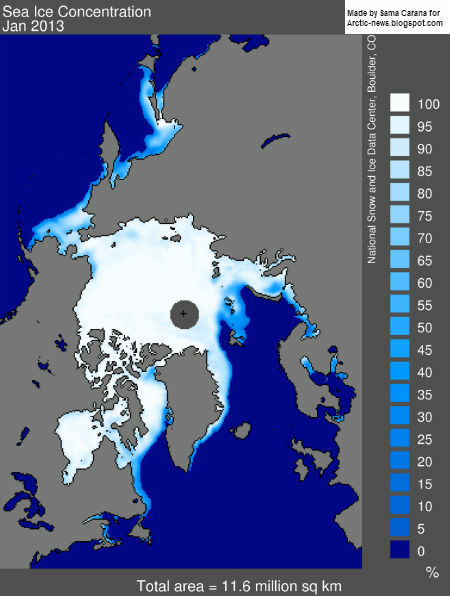 Meanwhile, we'll keep a close eye on methane levels in the Arctic, particularly given the prospect that large areas of the Arctic Ocean (Kara Sea, Laptev Sea and East Siberian Sea) will soon become free of sea ice. 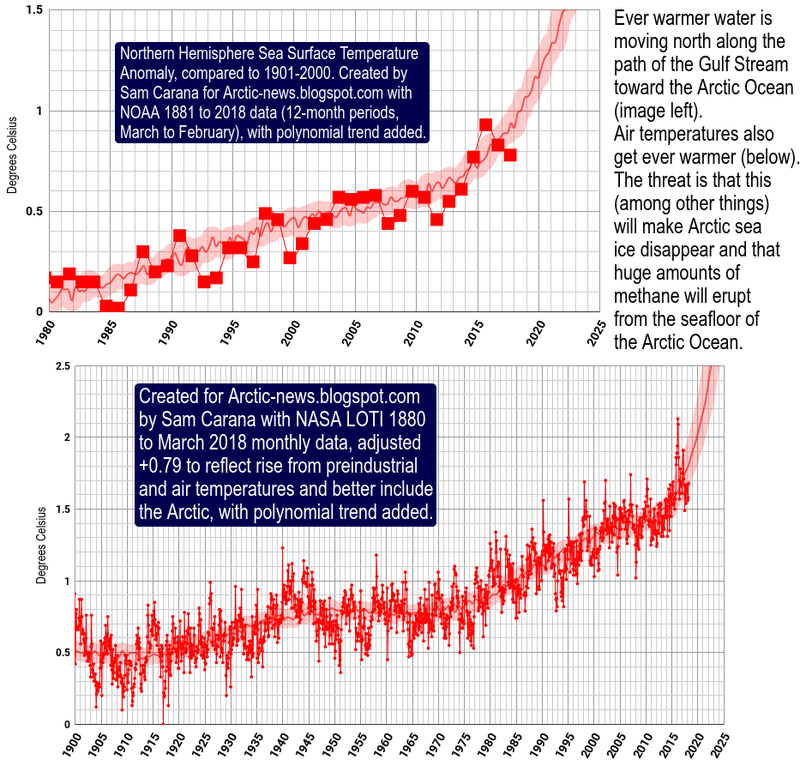 Further people analyzing methane levels are invited to also comment on the situation in the Arctic. Below a combination of images produced by Dr. Leonid Yurganov, showing methane levels January 1-10, 2013 (below left), January 11-20, 2013 (below center) and January 21-31, 2013 (below right). Above image shows dramatic increases of methane levels above the Arctic Ocean in the course of January 2013 in a large area north of Norway. Why are these high levels of methane showing up there? 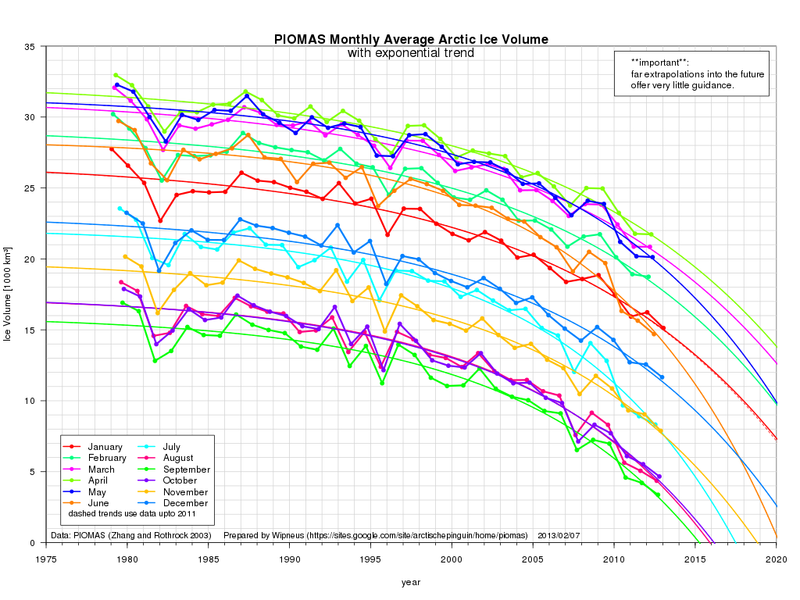 To further examine this, let's have a look at where the highest sea ice concentrations are. The image below shows sea ice concentrations for January 2013, from the National Snow and Ice data Center (NSIDC). 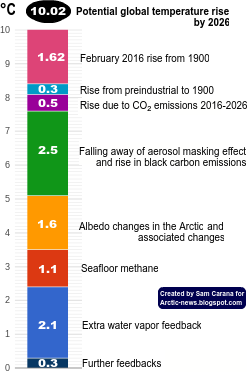 Overlaying methane measurements with sea ice concentrations shows that the highest levels of methane coincide with areas in the Arctic Ocean without sea ice. This is shown on the animation below, which is a 1.84 MB file that may take some time to fully load.